For the most part, dogs are always in the mood to play. From the second they wake up in the morning to long after you've called it night, a dog would love nothing more than to spend time with you and have fun. Unfortunately, not all dog owners have the time to keep their pooch entertained. If you're like most people, you have to spend a significant amount of time away from your dog every day. Whether you have to leave your canine companion for the daily grind of work or you simply need to use a few hours running errands, dogs have to spend a lot of time by themselves. Bored dogs are notorious for wreaking havoc on their homes, so it's a good idea to find them something for them to do while you're away. Treat-dispensing toys are a great solution. While they may seem simple to us humans, the designs pose a significant challenge for your furry friend. As the name implies, they can hold tasty food to entice your dog to figure them out. Not only will it keep them occupied, but it can expand their minds by providing mental stimulation. Here's a collection of some of the best treat and food-dispensing dog puzzles. This toy from Cheerpet is simple but effective. 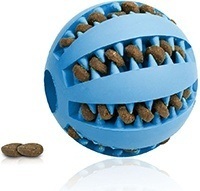 The round ball design is something that dogs are familiar with, so they'll have no problem using it. The exterior of the toy is made from TPR material. It's food-grade and completely BPA-free for safety. Unique textures on the surface of the ball will attract your dog and clean their teeth without them even realizing it. To set the puzzle up, simply open up the window and fill it with your dog's favorite treats or kibble. The twisting door can be adjusted based on your pup's skill level. 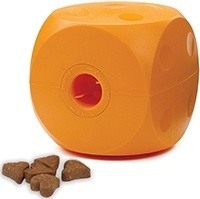 The Buster Food Cube can keep any dog entertained for hours on end. 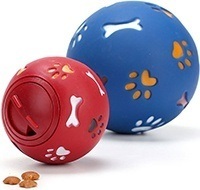 It's a simple dispensing toy that can be filled with small treats or dry kibble. You can manually adjust the difficulty by twisting the cylinder in the middle. This makes the access hole bigger or smaller. To be rewarded, your dog will need to rock and tumble the cube until the opening of the food compartment lines up with the dispenser hole. The toy is made of durable plastic that can be washed with standard dish soap or by tossing it in the dishwasher. Get your dog moving with this rolling treat-dispenser toy. It's made of durable plastic materials that will withstand the rigors of regular use. For your pup's safety, the plastic is non-toxic. The toy can be separated and cleaned with a simple twist. It can be filled with small treats or standard kibble. The ball has two separate compartments. One compartment holds the treat. Your furry friend must roll the ball to get the treat to fall out of the first compartment's hole and into the second compartment. They must then line up the final hole to get the reward. 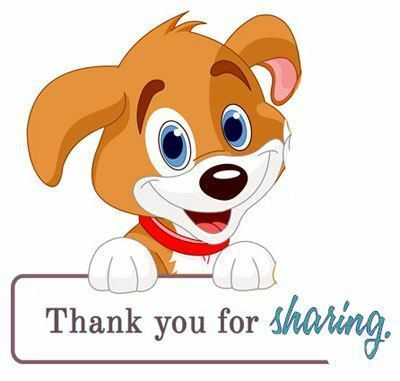 This unique puzzle activity is designed to promote interactive play between you and your dog. The toy consists of a large circular tray that has multiple small cells. You can choose to fill these cells with a delicious treat that your dog will love. Small bone-shaped covers fit snugly over the compartments to keep them out of view. Each cover has a small ventilation hole so that your dog can use their sense of smell. The fewer treats you hide, the tougher the challenge will be. The goal is for your dog to find out which compartment is hiding the food. Give your dog some independence and let them earn their own treats. This toy from Outward Hound can teach your dog a variety of useful skills. It's designed to look like a slot machine. A hatch door on the top of the unit makes loading the toy with kibble a breeze. There are three separate treat compartments, so you can mix and match your dog's rewards as you please. 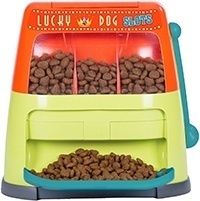 With a press of their paw, the toy will release the food onto a tray at the bottom of the device. 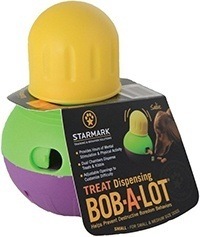 With the Bob-A-Lot toy from StarMark, you can provide your dog with a full meal of kibble. It has an impressive capacity of 3 cups. Food can be loaded into the larger bottom compartment. It has a number of openings all around the perimeter. They can be adjusted based on your dog's skill level. The weighted bottom will keep the oblong toy upright. It has an anti-slip coating as well. Your dog will have to rock the toy back and forth to move the treats around until they fall out. If you're looking for an option that provides your dog with a versatile playing experience, consider this toy from Dogit. It has 3 different games all built into a single floor unit. It's made from durable plastic and includes four suction cups that will keep it steady on the ground. Numerous accessories allow you to modify the game to meet your desired playing style and difficulty level. You can play a simple game of hide and seek using cover tops, a spinning wheel, or sliding doors. 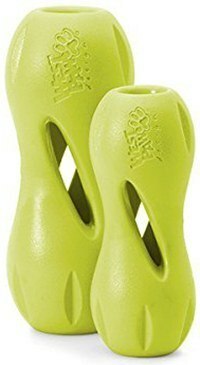 The Qwizl is the perfect treat-dispensing toy for avid chewers. It's made from a durable plastic that can hold up well to the jaws of a strong dog. The material is free of latex, BPA, and phthalate. It's also FDA-compliant. The unique thing about this toy is that's capable of holding much more than just small treats and kibble. It can be used with everything from apple slices to jerky sticks. Simply insert the food into the center of the toy. It will grasp the item tightly, requiring your dog to pull it out. This ball can encourage your dog to exercise. It holds treats on the outside with soft and pliable thorns. Alternatively, you can stick some food in the middle of the ball. Your dog will have to roll, chew, and paw at this toy to get every last bit of food you put in there. It's made from non-toxic rubber. It's tough enough to last through many play sessions but soft enough to get rid of plaque and tartar on the teeth. The material has a subtle mint flavor that's designed to freshen your dog's breath as they chew. Dogs are easily motivated by a bit of food. 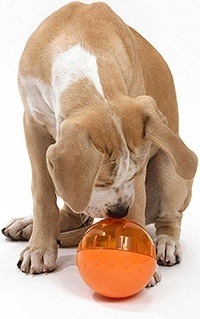 Food dispensing treats are a great way to encourage your dog to do something productive with their time. Instead of sitting around all day or causing a ruckus, that whiff of food will make them determined to solve the puzzle. This can be beneficial in a number of situations. It can be used to get an otherwise lazy pup moving and excited to have fun. Many owners use these toys alongside their pooch. Playing together can help you create a stronger bond. You'll be able to show your dog how it's done, effectively treating play time as a training session. Not only that, but the treats act as a reward for a job well done. If your dog isn't used to playing with complex toys, they may have a difficult time getting started. Instead of being motivated to solve the puzzle, they may just get frustrated that they can smell the treat but can't get to it. It's important that you overcome this hurdle by providing them with a bit of extra encouragement. Start off with a very simple toy. 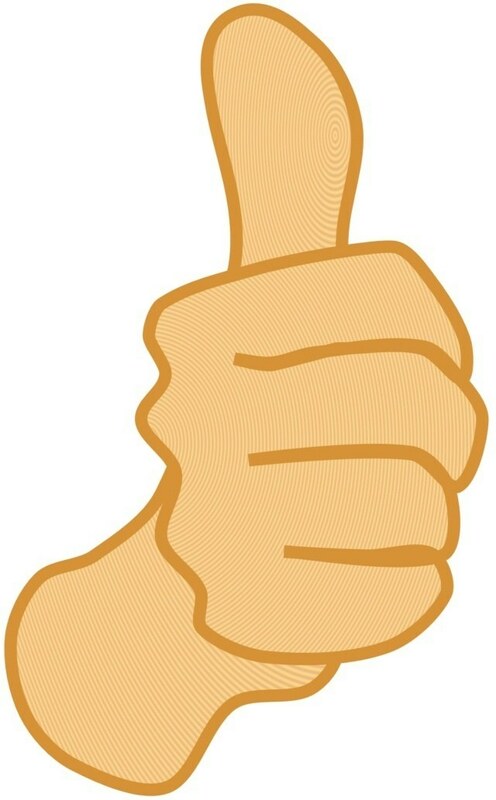 Many products can be adjusted to make things a bit easier. Fill it with a high-value treat that your dog loves and let them figure it out on their own. You can nudge them in the right direction by showing them how to access the treat, but it's important that you don't give up. If you give the morsel of food to them before they solve it, they'll never be motivated to do it on their own. Be patient as it may take them all day. Over time, you can gradually increase the difficulty and introduce new toys into the mix. Your dog will come to love the challenge. These unique toys offer more than just entertainment. With continued use, they can provide your pooch with a number of great benefits. They're frequently used by professional trainers to encourage positive mental and behavioral changes. One of the most common reasons why dog owners choose to invest in treat-dispensing toys is to prevent separation anxiety. Many dogs go into a frenzy every time their owner leaves the house. They want to spend all day with you, so it's no surprise that they'd be devastated when you're not there. Dogs can communicate this stress through persistent whining, barking, and even howling. While you may think that these feelings go away when you return home, ignoring their emotional needs will only exacerbate the problem. Toys can help your dog regain control over what they're feeling. Leaving them with a toy will keep them distracted and entertained while you're gone. They may become so focused and involved that they don't even realize that you've left. Mental stimulation is important for dogs. They need a constant challenge to stay mentally fit. As they solve puzzles and work their way up to more difficulty toys, they'll become more intelligent. The new skills they learn will make themselves known in other areas of their life. Your dog will start to figure things out on their own, which can be a very rewarding thing to see. Some toys are specifically designed to change up the way your dog eats. These toys can be placed directly in their food bowl to create an obstacle they have to get around or they can hold an entire meal's worth of kibble. High-quality toys will prevent your pooch from getting all of the food at one time. Instead of scarfing down their meal, they'll be forced to eat it slowly. This can help your pup avoid gastrointestinal issues and potentially fatal conditions like bloat. If you frequently come after a long day of work to discover that your beloved dog has destroyed something, you may want to consider a treat-dispensing toy. Behavioral issues typically stem from a lack of interaction and separation anxiety. Dogs will lash out by chewing on anything that seems even remotely appetizing. Sometimes, they'll do it just because they're bored. Toys can keep that destructive urge at bay. They'll have something to keep them occupied. Instead of chewing on your furniture they can work on getting that treat out. Over time, the regular stimulation may result in better overall behavior and temperament.